Get started quickly using AWS with the AWS SDK for Ruby. The SDK helps take the complexity out of coding by providing Ruby classes for many AWS services including Amazon S3, Amazon EC2, DynamoDB, and more. 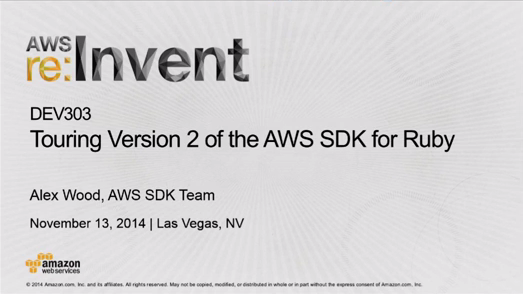 The SDK is provided as individual downloadable packages for each AWS service, which include code and documentation. The SDK is also available through Ruby Gems (http://rubygems.org/gems/aws-sdk). Version 3 of the AWS SDK for Ruby modularizes the monolithic SDK into service-specific gems, for example, aws-sdk-s3 and aws-sdk-dynamodb. Now each service gem uses strict semantic versioning, along with the benefits of continuous delivery of AWS API updates. With modularization, you can pick and choose which service gems your application or library requires, and update service gems independently of each other. You can see a full list of supported gems in the README on our GitHub page, which also includes a detailed upgrading guide for version 2 users. aws-sdk-rails: Provides Ruby on Rails integrations for the AWS SDK for Ruby. aws-record: Provides a data mapping abstraction for Amazon DynamoDB, built on top of the AWS SDK for Ruby. Version 2 of the AWS SDK for Ruby has a number of new features to help reduce the amount of code that you need to write. This talk discusses and walks through code sample for features such as the Resource APIs, paginators, waiters, and more. 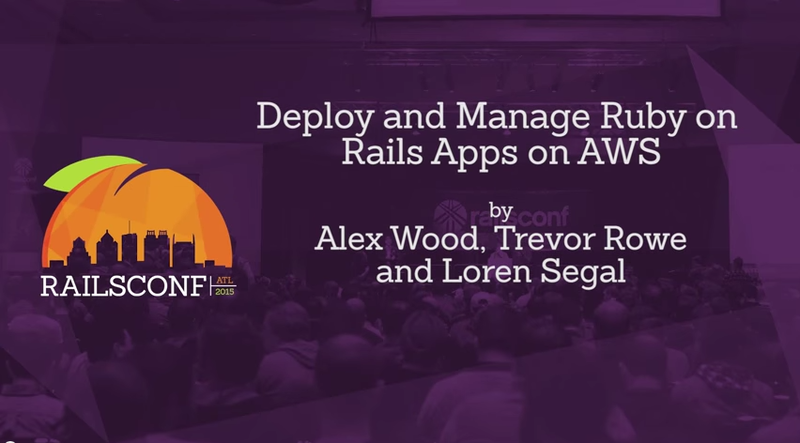 This hands-on lab will get you started with running your Rails applications on AWS. Starting with a simple sample application, you will learn how to deploy to AWS using AWS OpsWorks, then to enhance your application with features from the AWS SDK for Ruby's Rails plugin.